I am not going to romanticise cross country. It would be easy, though. Cross country is real running, the pursuit of the running purist, the preserve of the tough. I will stop there because the romantic idea of cross country at the quagmire of Denbies Vineyard lasted about three minutes yesterday. However, In these three minutes – the first three minutes, obviously – came two moments of epiphany-like joy. In the opening seconds after go, it was the sound. The sound of 250 or so pairs of spikes clacking in very close proximity, all surging purposefully and hopefully forward, on rough road and gravel. It was beautiful, harmonious. Then, a couple of minutes later after cresting a short rise, the course left gravel and passed to grass and mud. A new sound. The sound of squelching mud everywhere. It was equally beautiful. Thereafter, cross country became cross country: hills, mud and suffering. The course was three loops of a 2.5-mile circuit around Denbies; the occasion the Surrey cross country championship. I battled round, spending much of my time scraping mud out of an eye. I am searching for a positive here. It was not raining, I suppose. Not that that mattered. The ground was heavy with churned mud and sodden. We slithered down descents, slopped up hills, almost came to a grinding halt on a hairpin of slop. It was real, pure running, stripped of razzmatazz. There was beauty in the brutality, beauty in the simplicity. Stan Allen would have loved it. 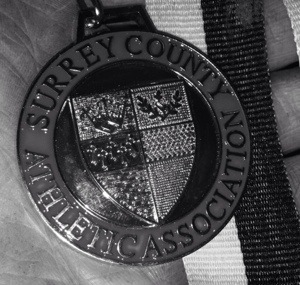 The silver lining: silver medals for Herne Hill Harriers’ senior men’s team, including me as fifth-placed counter.